PAMs, FAMs, and In-Between Mares: The scoop! From Gemini's online friend: We on Blab's Real Equine forum have followed Gemini's journey, with all the ups and downs, through Blab posts of years. We've encouraged, supported and sometimes counseled backing off, when we felt the financial or physical risk was becoming larger. 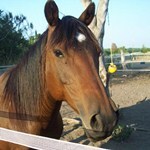 But always Gemini was on a path that many dream of but never achieve - to own her own horse. A horse that is truly hers in every sense - responsibility and all choices of what trail to ride next! This will open an article form. Instead of tab "Home" you will see tab "Articles." Has anyone purchased from Alistair Grandison? Has anyone purchased from Alistair Grandison in Germany? I've seen a negative report of a Sylvia Grandison in Germany from 2013 - is this the same person?